Scenario: You are a first generation momma and the books about Indian culture you were gifted by your cousins in India are way too graphic or too advanced with details that go way over your kiddos’ heads. Yet you still want to teach your littles about the richness of your heritage. About the morals those beloved Krishna stories taught you as a kid. So what do you do? That’s the same scenario founders of Desi Babies Reena and Mital had. When they each had their first baby, they struggled to find toys and learning materials that would connect their children to this huge part of themselves as Indians living in America. To say we relate is an understatement. At our last meeting, one of us recalled a book about the Ramayana we picked up at a local temple bookstore…thinking it would be a good one to share stories of at bedtime. Not only were the pictures scary (and it was labeled a children’s book), there was no censorship on the words of the violence to the demon King Ravana. Isn’t that what this journey is about? They are on a mission to create more products, apparel and books for families everywhere. Their current products promote diversity in that they are shareable with so many families. For instance, we personally love their 10 Noisy Rickshaws book so much, but so did our friend who is Polish and who has visited India numerous times. She was loving the illustrations as they took her back to her time there. And our littlest guy here at the Chai Mommas, Ayan, is obsessed with this puzzle. At 2, he now knows every god and goddess on it. Momma Puja attributes it to how fun it is for him to learn with a puzzle. With Diwali around the corner, it’s the perfect time to incorporate culture too. 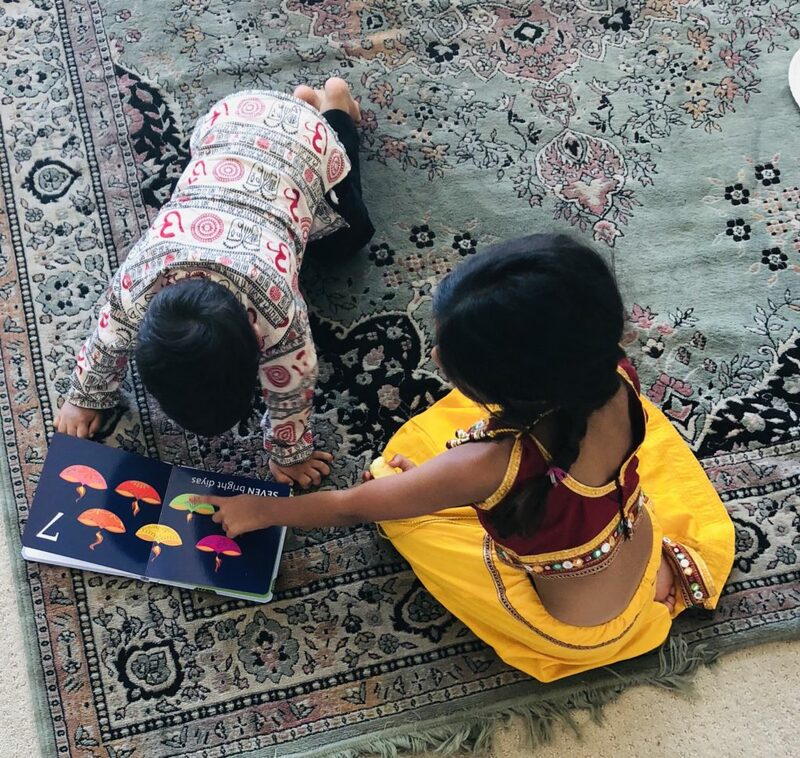 Their latest book, “Twinkle Twinkle, Diwali Lights” celebrates the beautiful and colorful festival of lights, which is so nice to read at bedtime while we anticipate Diwali (with our Love + Light box, of course). 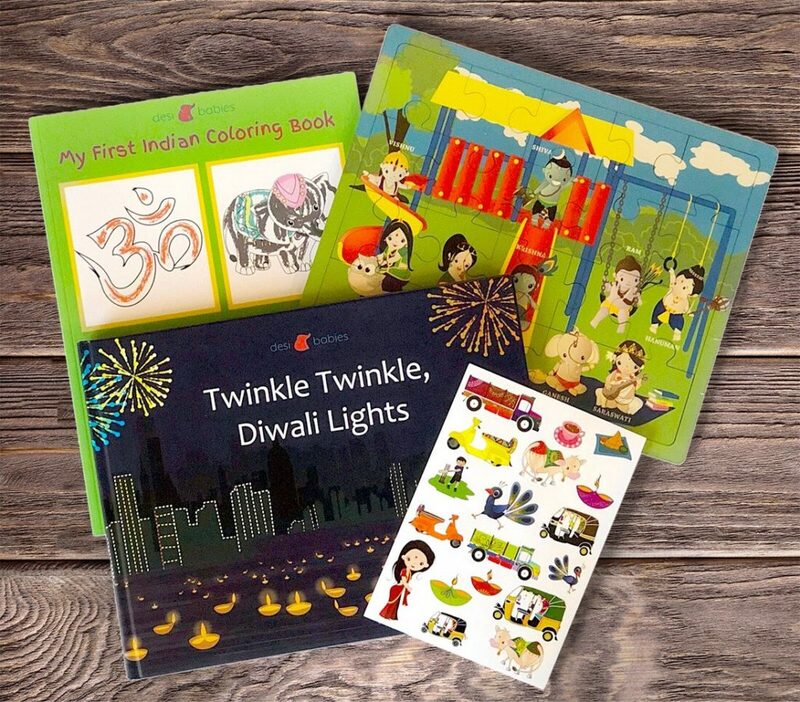 Desi Babies has decided to give our readers a special code in the spirit of giving for Diwali. Use CHAIMOMMAS and save 15% when you order anything from their site here. And remember to enter the Chai Mommas and Desi Babies Diwali giveaway (see items below) on Instagram @thechaimommasblog until Nov. 4th!